Yesterday I completed my Tidal Wave Socks (PDF link). Notes: Not much to say about the pattern. By the second sock I had the pattern down, but I had trouble keeping track of the beginning of the round during the pattern part. I really do like Socks That Rock yarn, but both times I’ve made socks with it, it has pooled in a way that it stripes. *sigh* I almost ripped this out for that reason alone, but there was no other pattern that I would have wanted to do this in, so I left it. I like them even though you really can’t see the pattern that well. Bonus: they fit great! This will be bad for my budget! I’ve been listening to Lime & Violet‘s older episodes (I’m starting from the first one and working my way current) and I’m currently listening to Episode 10. In this episode, they talk about a place you can order custom dyed yarn for CHEAP called Mystical Creation Yarns. Of course, after they gushed about how great the colors were and how cheap they are for what you get, I had to go take a look. Oh my goodness! I have a feeling that I will be ordering at some point, but just not right now. I want to so, so badly, but I’m being reasonable here. It’s not in the budget and I’ve been doing quite well buying little to no yarn. I did recently buy some yarn that I really want to tell you all about, but I want to knit up a little swatch first to give a full review and tell you the story of how I found this seller and what is to come. In light of all the good stuff Lime & Violet talk about, I am going to create a link list in the sidebar with yarn shops – both local and online. It will be a good place for my own reference and maybe some new stuff for you to check out! I’ve been thinking a lot about the sweaters I want to knit and the yarn that I have. While I really, really want to knit the Notre Dame de Grace pullover, I’m not entirely thrilled by the thought of knitting in double seed stich FOREVER right now. 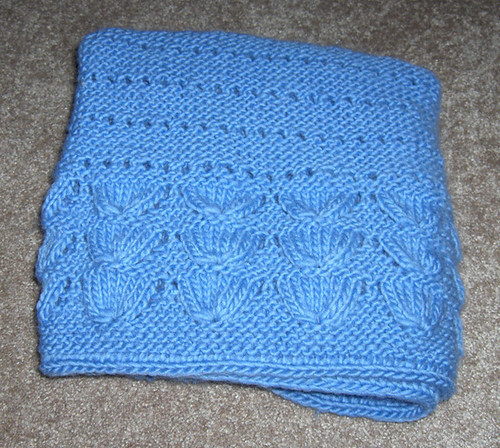 Don’t get me wrong – I love the way it looks and I think it will be look great in the yarn I have for it. That being said, what I really want right now is some simple, mindless knitting that will get me a sweater. I do love working on Starlight and the yarn is a joy to work with, but every 4th row is a cable row all the way across 50 zillion cables (okay, I’m totally exaggerating, but you get the idea). I’m not digging that right now. I want to knit and not think much about it. 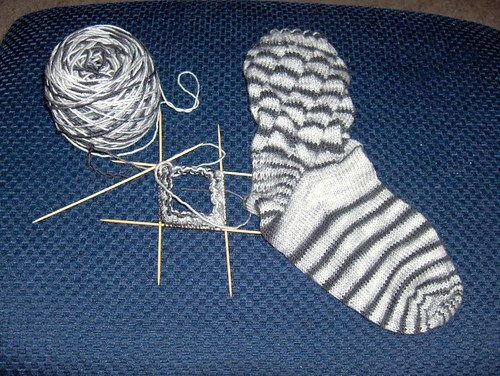 I think this is why the socks are almost done – the foot is just knit around and around and around… I love it right now! Every other project I have is taking up mucho brain power and I’m just not into it. I keep thinking about that darn Noro in my stash. It calls to me to be knit. It needs to be a sweater, a cardigan sweater. Just what I need right now – the pretty colors of Noro in something simple. I know exactly what I want to do with it: Top-Down Raglan Cardi. Tonight, I will cast this on and I have a feeling it will be done in no time. Seriously, though, I’ve been thinking about it since I saw it almost a week ago and it is still there. Hot Dog on a Stick totally reminds me of living in Southern California and long days spent on the beach during childhood. Oh, how I miss it! If it is still there when I get home tonight, I may buy it. I’m going to complain for a moment about the US not being on the bandwagon with the metric system. Who decided that we shouldn’t go to metric and why did "they" decide this? I want answers! Maybe I wouldn’t notice if I weren’t a knitter. Maybe I’d go about my daily life oblivious to the difference between inches and centimeters and never needing to care. Fact is, I’m a knitter and lots of knitterly things are in metric. Most especially needles and patterns. Quite bothersome to have to have BOTH measurements, but most do. My main gripe is with the needles, though. I’m irritated by the fact that there is no standard US 1 needle. It would be easier if there were no US 1 and it was just 2.5 mm or 2.25 mm or whatever mm size you needed. I look at the package for the addi’s. 2.5 mm. I quickly realize that my DPNs must be 2.25 mm. This won’t work. I can’t risk a change in gauge, however small, on such a large, intricate project. This means I need new needles. I really don’t WANT more needles, but I don’t see a way around it. After this table cloth is done, I have a feeling I will have a LOT of addi circular needles that are 2.5 mm since there is not an interchangeable set out there for such small needles. Anyway…. enough with the rant. I’m over it. I just have to deal with it and buy more needles as I need them. I’m going to the yarn shop after work and hopefully I can find what I need. My sister will be coming with me because she needs needles for the hat she’s going to make (her second project!). Maybe I’ll get a little yarn therapy while I’m there. Some pretty sock yarn or something. Since it’s been a while since I showed some pictures, here’s one of my completed sock and the beginning of the second sock. I’m already about half way down the cuff of the second one, but this photo was taken two days ago before I got so far along. On that note, I’ll get back to work! I have decided on what to use the Wool of the Andes sweater yarn for. I even did a swatch, washed it and blocked it. For something like a sweater, I usually swatch, but I’m not always on top of the washing/blocking thing. I’m learning, though! I figure that if I’m going to put so much effort into something, I should make sure it’s going to turn out right. I’m going to be making Notre Dame de Grace pullover from Interweave Knits Summer 2007 issue. At first, I didn’t much care for it, but looking back on it now, I quite like it! I showed it to Nick and he immediately said he liked it very much and thought it would look nice in the purple yarn I purchased. I even have more than what I need in terms of yarn yardage for it. I actually got gauge on US 7’s, which surprised me. I don’t know why, but when I measured the swatch the first 10 times I thought my gauge was totally off. I kept looking at the pattern and my gauge swatch and for the life of me couldn’t figure out why I was so off. I must have kept getting the numbers in my head mixed up. Today when I looked at it again, I realized I was spot on. I’m finding it difficult to not cast on RIGHT THIS SECOND, but I’m going to be good right now and at least finish the socks I’m working on before I get going on another project. I want to make the Sock a month KAL deadline! I’m done with one sock and I’ve already cast on for the second. I doubt it will take me long to finish it. On another note, I was requested to knit something for a friend of mine. He requested that I knit him bright pink knee high toe socks. Yes, my male friend requested this. (And for the record, no, he’s not gay.) I can’t quite figure out why pink or knee high or toe socks, but how can I not love something that’s pink and will become toe socks? He’s a very good friend and I’m more than happy to make them for him. I already have a good idea of what to do with the pattern. He says he’s going to wear these to play soccer, so I’m thinking ribbing from top to bottom would be a good idea since they will stay up better. I will be knitting these somewhat blindly because he lives in California and is going to email me the requested measurements. I’ll have no way of knowing if they will really fit until he gets them (no trying on as I go). You know, I must really think of him as a good friend because he has size 11 men’s shoes and knee socks are no small thing and toe socks are something I haven’t done before. I think about it, though, and I’m more than willing because I rarely get asked to make anything knitted for anyone and I always WANT to knit things for people, but not if it won’t be appreciated or wanted. I’m actually really excited about knitting them! Now I just need to pick out the yarn – anyone know of some good bright pink sock yarn? Yesterday I received my Knit Picks order in the mail. The Shine yarn I ordered was not as I expected for colors. In fact one was NOTHING like I expected and now I don’t know what to do with it. I may just order another skein in a different color and make a hat or something out of the color I didn’t expect to get (ordered correctly, but not what I expected for color – it’s SO different than the website/catalog). I won’t get into that, though, because it’s no big deal. I did get one of Elizabeth Zimmerman’s books and I totally love it! I have a feeling you’ll see one of those Baby Surprise Jackets that everyone else is making right now. For some reason, I just have this need to make it even though there is no recipient for it. Now, on to the major thing at hand. I bought enough Wool of the Andes to make the Wheat-Ear Cabled Yoke sweater that was on the cover of the Summer 2007 issue of Interweave Knits. As I was swatching and preparing myself for casting on in a few weeks for the Knit-along, I was looking at the sweater, going over the pattern and I just kept thinking: "How much do I really like this sweater?" I mean, a sweater is a big commitment and I want to get a bit of wear out of it – I don’t want it to suffer the fate of other FO’s and just sit in the stash after being completed and not get any use. I don’t really knit to get useful things, honestly. I knit because I really LOVE knitting. However… this is a SWEATER. This will be my third if you want to count the one that I’m currently working on which is a cardigan. I love, love, love this color. It’s a deep purple and it’s heathered – BEAUTIFUL! I want people to see this gorgeous yarn and I want to wear it. So… I had a change of heart. I didn’t want this Wheat-Ear Cabled Yoke sweater any longer. I was going to make modifications and while that is not a problem, I just wasn’t up to it if I wasn’t going to love it when it was done. I’m thinking of a different pattern now, possibly a pullover, but I’m also considering a cardigan. I don’t know what it’s going to become right now, but I’m on the lookout for a new sweater. The yarn is aran/worsted weight and if you have any suggestions on what to make with it now, I’m open to possibilities. Since I can’t show the shawl just yet, I’ll talk about my other WIPs. Recently, I was totally taken by doilies. I searched some free patterns, found one I liked, purchased some crochet thread and got started. I checked out some options for the Table Cloth Project and decided that Aunt Lydia’s would be both economical and a good choice for it because it comes in these huge things with 2700 some yards which means less ends to weave in. I chose some to "test knit" with. I chose the project above and so far I really like how it’s turning out. Here’s something, though… it’s knit on US 1’s. Eeps! I know, I know… a whole table cloth on 1’s? Crazy you say? Yes, you could say that. Here’s the thing, though. I know it will be loved well and it is going to someone who can totally appreciate such a unique handmade item. My work will not be in vain. Besides, this will prepare me for taking on the Wedding Ring Shawl. If I can do this, I can totally do that. I’ve been working on Starlight as well. 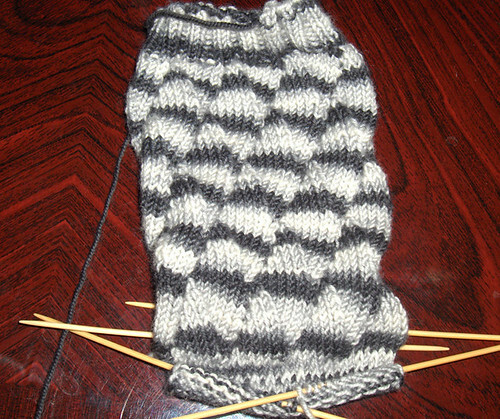 I didn’t take photos, but I’ve done about 5 inches above the ribbing section now. It’s moving right along! Aside from the knitting, we’re getting ready for Nick’s son to be back and for a brief visit from his parents. They’ll be here on Thursday. Wish me luck!! Knitting will be keeping me sane, so expect to see some progress! I was on Ravelry (big surprise, right?) and I came across a doilies group. 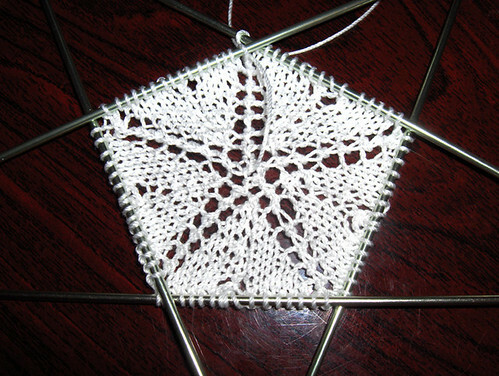 I was reading the threads and completed projects and now I simply MUST knit some doilies! I know that I will probably not use them because they really aren’t my thing, but I love them! I want some of my own – beautiful pieces of small lace. Nick was sitting close to me, looking when I expressed how much I must knit this NOW and I showed him a beautiful table cloth. He asked how long it would take to make. Guessing, I said probably a year, maybe 6 months if I worked on it non-stop. He requested that I knit it for his mother for her birthday next year and I agreed I would. I already know that I can get some of the "good stuff" for making doilies at Hobby Lobby – they have a pretty big selection there. Since I need the pattern, I need the book it comes in, which is Second Book of Modern Lace Knitting by Marianne Kinzel. He said that I can go ahead and order it next week (when funds aren’t quite so tight) and since it’s from Amazon and free shipping is a good deal, I’m also going to get First Book of Modern Lace Knitting also by Marianne Kinzel. I need a little more to get the free shipping still, but I have plenty of books on my list, but I haven’t decided which one yet. I do have some Aunt Lydia’s crochet thread in my stash that I’m going to swatch with and see how it comes out to see what size needles work with it. I want to work on a small one until the books arrive and I can start contemplating color and material for the table cloth. In other, non-knitting news, I got some chairs for the kitchen table. We got the table free at a garage sale, but no chairs, so today I went hunting and managed to get some for a total of $160 ($40 each and I got 4). Not too bad. Less than I expected to spend. We needed them since Nick’s parents are coming next week to bring Nathaniel home. We need to be able to sit at the table now that he will be here and while his parents are visiting. Anyhow, I should really go to bed. I’m going to be car looking with my friend from work tomorrow. She needs a new car – she was in an accident a little over a week ago. No worries, she’s fine, but her car was totaled. Nighty night!